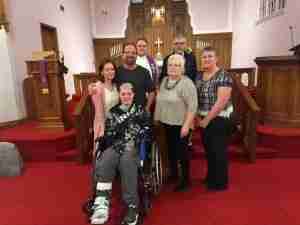 A check for $997 was presented to Megan Magers and family after church service on Sunday, March 24, 2019. The Outreach committee headed a fundraising congregate meal with Thrivent Action Team dollars after church on March 17, 2019 with the proceeds going to Megan to help with expenses following an accident. We give thanks to God for a generous and giving congregation!